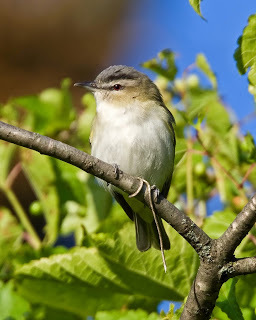 Starting in the springtime, usually by late April, you’ll start hearing the Red-eyed Vireos at the Inn on Mill Creek B&B singing a lovely song of gently slurred notes, with phrases ending in an up-note or a down-note, making it sound like the bird is sweetly tweeting a short question and answering it. Over and over, and over and over. Typically, the song comes from the trees that border our orchard, or from the trees near the Carolina and Oak Leaf Rooms on the north side of the B&B. Even when the other birds take their afternoon break and the forest is otherwise quiet, the Red-eyed Vireo just keeps on singing. We love the return of this bird from its winter home in the Amazon, so we’re giving the Red-eyed Vireo the April spot in this year’s 12 Months of Birding at the Inn series on our blog. Red-eyed Vireos are olive-green above and clean white below with a strong head pattern: a gray crown and white eyebrow stripe bordered above and below by blackish lines. The flanks and under the tail have a green-yellow wash. Adults have red eyes that appear dark from a distance; immatures have dark eyes. They aren’t the easiest birds to spot once the leaves are full on the trees, but just keep following their song and be patient. They like to hang out in the canopy of trees all day, munching on their favorite food, caterpillars. And singing. About that song: The Cornell Lab of Ornithology reports that a male Red-eyed Vireo can sign up to 20,000 times a day! And even though it sounds like the same song, each bird can have 30 or more different types of tunes in its repertoire, and more than 12,500 different types of Red-eyed Vireo songs have been recorded. So, when you’re at the Inn on Mill Creek B&B in late spring and during the summertime, take a listen to the daytime singing of our winged neighbors. Chances are likely, you’ll hear a Red-eyed Vireo at some point during your stay.